Keep your blades sharp – We’re talking about your lawnmower’s blades. Having sharp blades will reduce the need for a second (or even a third) pass of that lawnmower. It’s also noticeable that lawn grass is healthier when mowed with sharp blades. Mow frequently – Does this mean you’ll have to spend more time mowing your lawn? It does the opposite, actually. Mowing the lawn once a week, instead of once every two or three weeks will lessen the time you need to make passes across your lawn, since you only have to mow approximately 1/3 of the blade grass. This also means less time for clean up since the grass has not grown that much yet. Weed problems? Don’t pull, spray – No matter how hard you try, there will always be a weed or two in your gardens and lawns. Instead of pulling them out, try killing them off with a reliable weed killer. 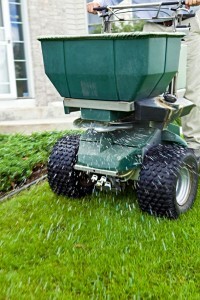 There are many products out there that only attack weeds, and will not harm your grass. Spraying also helps prevent future weed growth, unlike manual pulling. Water, water, water – Watering your lawn faithfully is crucial, especially for newly seeded lawns, otherwise you’ll waste both time and money when your new turf grass doesn’t grow. If you can’t stick to a schedule, it’s always best to invest in buying a timer or installing a temporary irrigation system. Imagine watering your lawn a few times a day: wouldn’t an automatic system save you time in getting ready to set-up your hoses and sprinklers? Prevention is better than cure – If your lawn had a history of pest infestation or plant disease, it’s best to take precaution and treat the space to prevent future infestations. There are many products out there that can help control and prevent pest infestations. Also, be aware of the pests/plant diseases that are more prevalent during a particular season. This will save lots of time and money, since you won’t have to regrow/replant seeds, which will most likely happen once your lawn is infested. Call in the pros – Even if you’re the greatest DIY-enthusiast out there, there are still some things that are better left to the pros. You’ll save time by not having to re-do a task because of a possible error you may commit, or the number of trips you’ll have to make back to the store because of an essential item you may have forgotten. Professional landscapers like Springfield Gardens are well-equipped and have years of professional experience to handle your lawn maintenance needs. Be wise. Invest properly and contact Springfield Gardens today. (417) 882-7800.